Hi guys! It's going to be a busy week here on the blog. I plan on finishing the Zoya Party Girls Collection as well as showing some new shades releasing from Noodles Nail Polish and Literary Lacquers. Tonight I have Part II to show you, and it features a few more cremes and one slight duochrome. Let's take a closer look, shall we? Up first is Delaney which is a purple base that shifts between gold/green/blue depending on the angle. The shift is easier to see in the bottle, but it's still noticeable on the nail. I used 2 coats for the photos above, and the application was just fine. To be honest, I was a bit surprised to see a bright pink in a winter collection. I mean, I love a good pink any time of year, so why not? Zoya calls this a "muted, cerise pink creme" which is far from what I'd describe it. To me it's a bright pink fuchsia creme. Again, 2 coats were needed, and it applied really well. I'm going to steal the description from Zoya on this one because I think they hit it on the nail (pun intended). Landon is a deep aubergine purple creme that is slightly less dusty than my pictures show. The formula was a bit thinner than my ideal formula, so watch out for flooding on the edges and cuticle area. There are 2 reds in the collection and Ming is the lighter of the 2. It's a true scarlet red that leans more towards a jelly than a creme polish. With that said, it takes a bit more to build up the color, so I used 3 thin coats for the photos above. Most people will be able to get away with 2, but bright lights tend to show visible nail line hence the 3 coats. It dries with a shiny finish even without topcoat...but I always recommend a good topcoat for longevity. 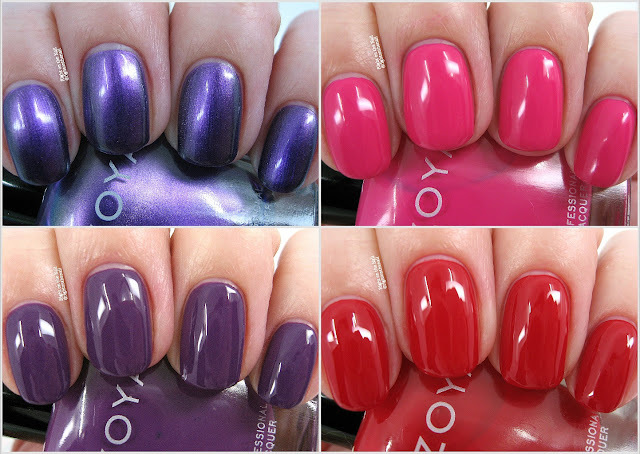 There you have it, 4 more polishes from Zoya. Are there any winners in your book? Zoya polishes retail for $10 and you can find out more about them on their website, Facebook, Twitter, or Instagram pages. Keep an eye out for them in your local Ulta store if you want to see the bottles in person before you buy.